Meek Mill arrived on stage at Summer Jam on a dirt bike and it was so badass! - Ooooooo La La! Meek Mill arrived on stage at Summer Jam on a dirt bike and it was so badass! Meek Mill had thee dopest entrance to the Summer Jam stage! Meek Mill rocked Hot 97's 25th annual Summer Jam concert on Sunday night (June 10) at MetLife stadium in East Rutherford, NJ. The 31-year-old Philly rapper, who was recently freed from prison back in April, circled above the stadium in a helicopter for about an hour, according to local residents in the area. 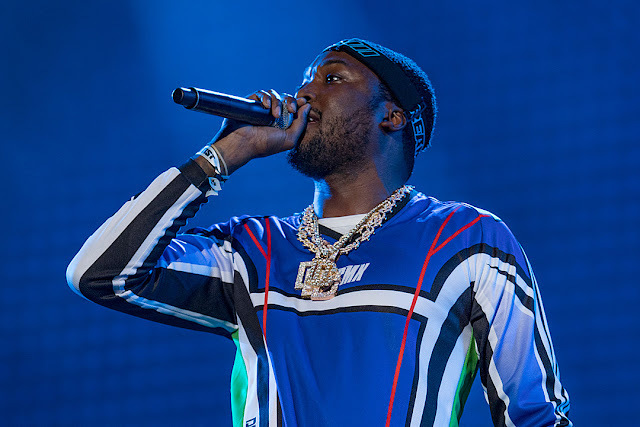 When it was his turn to perform, the helicopter landed, Meek and his entourage walked out and hopped on dirt bikes where they rode around Meadowland's racetrack up to the MetLife stadium entrance and unto the stage infront of thousands of screaming fans. This year's Summer Jam was headlined by Kendrick Lamar. The event also featured appearances from Lil' Wayne, Swizz Beatz, A$AP Ferg, and Remy Ma, and had surprise guest appearances from Timbaland, Lil' Kim, Bun B and more.